Your biggest dilemma when buying another home is deciding whether to buy first or sell first. Either way is risky because you could wind up owning two homes or none at all. Well, our Guaranteed Sale Program solves this dilemma. 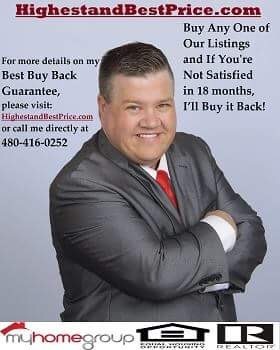 You see, BEFORE you even list with me, I prepare a total market analysis of your home, including a computerized printout of all comparable home sales and current listings in the area. Using this information, together we determine a market value for your home. This also determines your guaranteed price and list price which you receive upfront and in writing before I begin to market your home. Think of this as a better than risk free insurance policy. When you receive this guaranteed price from me in writing, you will have the security of knowing that your home is guaranteed to sell.